Here We Go Again: Tech Bubble 2.0 but "This Time It's Different"
The doses of Delusionol(tm) required to believe "this time it's different" are becoming dangerous. The "Uber of dog-walkers" is worth a cool $1 billion pre-IPO. Or maybe it's the AirBNB of dog-walkers, but who cares? Just as any company with no hope of profits skyrocketed once it put blockchain or crypto in its name during the cryptocurrency mania of late 2017, now calling a dead-on-arrival start-up "the Uber of...." is enough to justify a billion-dollar valuation. A scooter-rental company in a very crowded field of never-will-be-profitable scooter start-ups is worth a cool $1 billion--but heading to a $10 billion valuation because... well, it's the Uber of scooters. The cost of operating a very complex vehicle will never be near-zero, and neither will the liability. Many other transport options will always be available to customers, starting with walking, public transport, biking, arranging a ride with a friend and the "black market" ride-sharing options that are inevitably arising to cut out Uber's fee. Then there's Apple, now north of $200 a share again despite a deterioration of their core profit center and the absurdity of their "strategy" of entering low-margin commoditized sectors already dominated by entrenched competitors: payments (banking) and content creation and subscriptions. Apple is slashing iPhone prices in weakening markets, and those discounts come right off the bottom line. Then there's the cratering of iPhone sales in China, previously a bright spot, and Apple's continuing dependence on iPhone margins for its massive profits. 1. The "services" Apple is entering are commoditized and extremely competitive, markets in which it has very little proprietary territory to defend. Payment systems and credit cards are commoditized markets: there is very little differentiating the options and the host of competitors is expanding rapidly. 2. Many competitors are well-funded and experienced in maintaining customer loyalty. Payment systems and credit cards aren't a sideline as they are for Apple; these are the banks' bread and butter and they will not make it easy for Apple to carve off a proprietary territory. 4. The content creation and delivery sector is also commoditized and fiercely competitive. There is very little to differentiate the services, near-zero scarcity value to Apple's offerings, and as the global recession deepens, consumers will be paring back their subscriptions, not adding them. There is quite a lot of free content out there and those on a budget have many options--for example, ignoring a few ads and getting content without paying any subscription to anyone. Laughably, the financial media is claiming "this time it's different" because the companies doing IPOs are "older and bigger." Right, which means their losses are correspondingly gargantuan and if they were actually in a profitable business, they'd already be profitable. But instead, the losses pile up and the doses of Delusionol(tm) required to believe "this time it's different" are becoming dangerous. 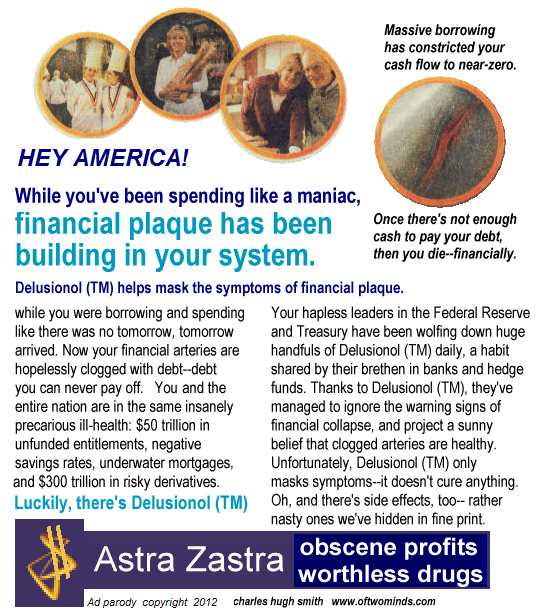 The money managers hooked on Delusionol(tm) also believe they have the magical ability to sell all their tech stocks at the very top, before they crash to reality-based valuations. Thank you, Bob W. ($5/month), for your superbly generous pledge to this site -- I am greatly honored by your support and readership.